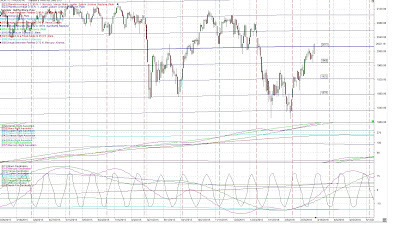 For the SP500, cycle-wise Feb 11 was the Primary cycle trough. 1 that started on Aug 24th. Feb 11th was a slightly lower low than Jan 20th low. Jan 20th was the low for a number of other indices. 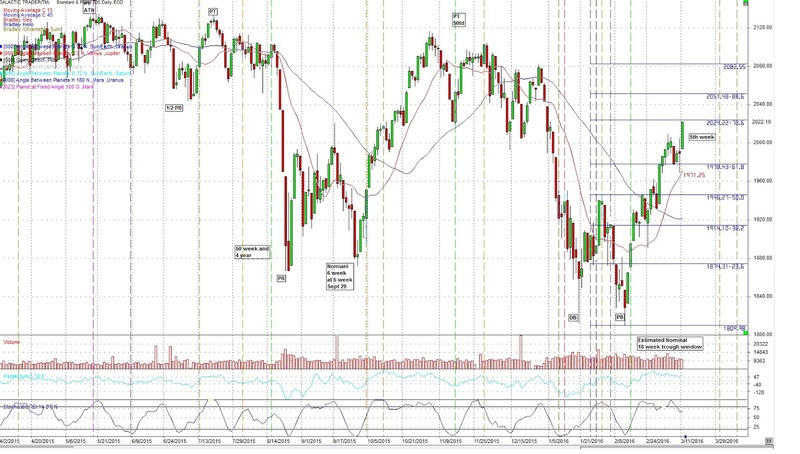 Feb 11th should start a new nominal 18 week cycle in the SP500 and we are entering the 5th week. 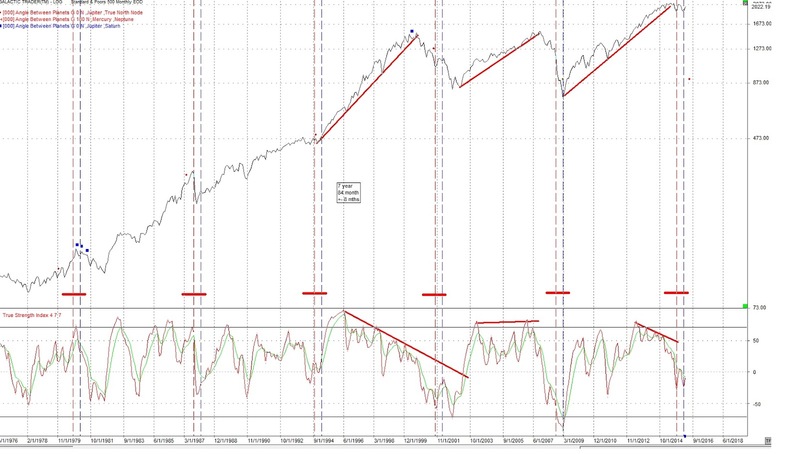 We most often see a nominal 6 week cycle to start a new nominal 18 week cycle. 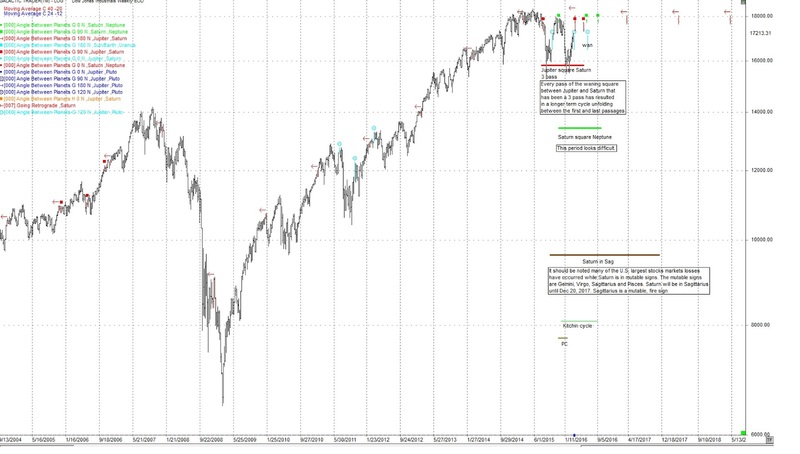 The 6 week cycles has a range of 5 to 7 weeks so we are in the time frame for a crest for the new 6 week cycle. For the markets, this should be a wild trip up and down. I'm looking for a volatile market in March and an explosive environment in April. April may see some violent events. The key dates will be in the April subscriber letter. The rise off the Feb 11 low has been more bullish than normally expected but this may be due to the planets in changeable mutable signs. Price is now above the 15 day sma and 45 day sma. The 45 day average is the 1/2 cycle to the 90 day or 18 week and the 15 day average is the 1/2 cycle to the 30 day or 6 week. The ALERT sent out to subscribers on March 5th will be updated this weekend with one potential critical date. From last week, the high we were looking for on March 7, 8 came in 1 trading day early on March 4th. We were not expecting the large increase on March 11 but it is in the timeframe where the 6 week cycle is still going up and with all the planets mentioned in mutable signs, it's the time for large price swings in both directions. Watch for these around the key dates we've mentioned. The time frame around March 23rd where we have the next Jupiter / Saturn square with Saturn turning retrograde would be good timing for a turn. This signature has a history of turns, both up and down. The fact it is the 6th week hints it will be a low. More price action is required to confirm this. Before this happens we have the Jupiter / Pluto trine on March 16th. 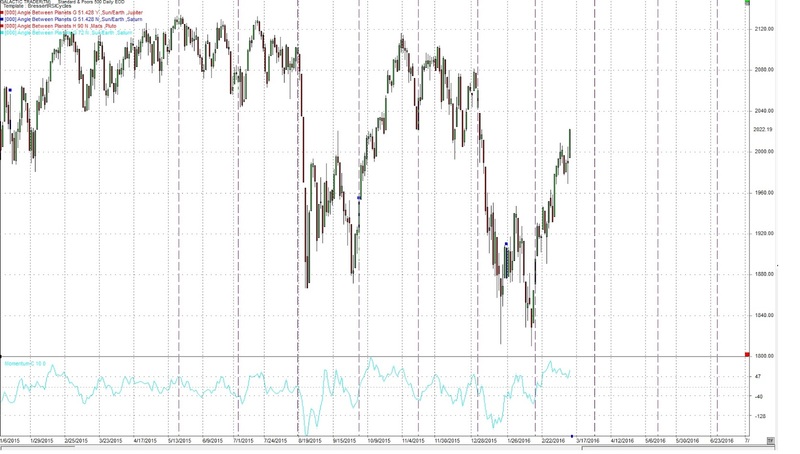 The latter aspect is somewhat unreliable but may be identifying a nominal 6 week cycle high near this date. There's not much in common between Jupiter and Pluto. The "Total Solar Eclipse on the evening of March 8th, New York time" turned out to be a non-event on the exact day. The subscribers letter described the potential long term effect of Solar Eclipses. We haven't heard the last of this eclipse. Watch March 14 and 15, geophysical events, markets and Syria. We have already seem some activity from this eclipse. The Moon was in almost exact square to the point where the eclipse took place on March 8th when the 7.8 earthquake hit off Java on March 2nd. This eclipse was also part of a T-square with Saturn acting as the focal point. That meaning the energy of the eclipse will be expressed through Saturn which can be restrictive and is in Sagittarius a mutable, fire sign, the sign of religion, nationalism and patriotism. Mars leaves Scorpio, where it has given Gold a huge thrust up and enters Sagittarius on March 5. This results in both Mars and Saturn in Sagittarius , a signature for a religious conflict or the amplification of one. Water may be a problem, too much in some areas, none in others. Starting in Mid-March there is a configuration on a cycle chart pointing to either a possible religious battle or trade war. Astrological forecasting is a process of identifying periods of time where the Astrological energy points to possible events in the future. There is similar, but stronger energy in mid-April for this type of event. I believe we are close to longer term cycle bottoms, both the 6.5 - 7 year cycle and the Kitchin cycle, 3.3 years (or 40 months). The Kitchin cycle probably bottomed on Feb 11th. Many markets made lows that day or Jan 20th. March 11 -15. On the last date, March 15, Mercury will pass over the point of the March 8th Solar Eclipse adding to the volatile environment. This may be an important day. For 2016 we have Jupiter, Saturn, Neptune and the North Node in mutable signs. In addition both Solar eclipses are in mutable signs. Mutable signs are about flexibility and the ability or need to change. They are also about things that are not in control and extremes. We are in for a wild ride for the next couple of months in the markets and other areas of life. Charts we have not shown for awhile. The first 2 charts are daily charts of the SP500, and the Russell 2000. 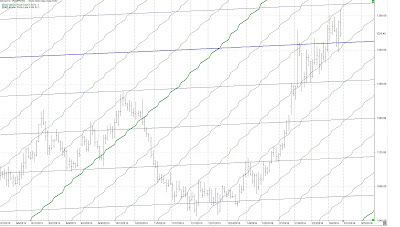 The horizontal blue lines are the average longitude of the planets Jupiter, Saturn, Uranus, Neptune and Pluto on all 3 charts This average is converted to price and displayed on the charts. Notice how well they have acted as support and resistance. 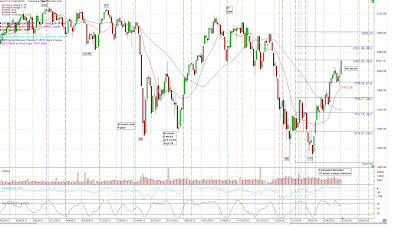 The SP500 went through resistance close to 2013. I'm watching to see if it holds above that level. 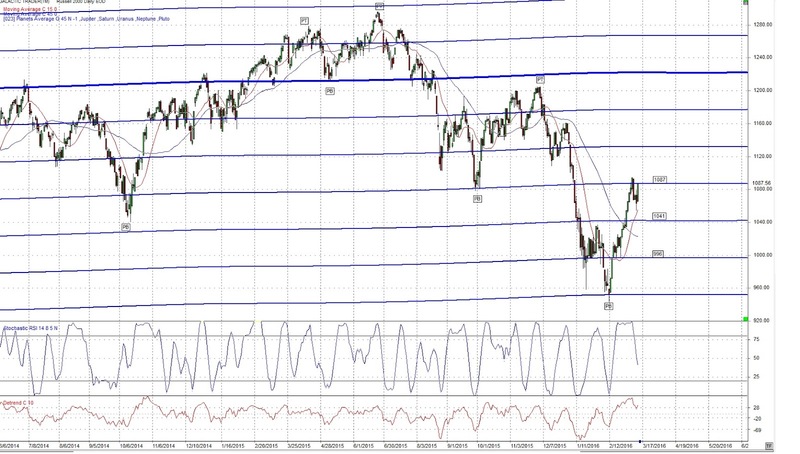 The other chart we haven't shown for a while is this Fan which started on March 6, 2009 at the low. The dark blue line has acted as support most of the way up. It is the 50% line or 45 degrees. The red line we have just touched is 61.8%. It hasn't been touched since Oct. 2011. The black vertical lines is a 512 cd's (calendar days) cycle which next falls on March 9, within one day from a powerful Total Solar Eclipse. 512 cd's, calendar days is a fairly long period so we should allow +- 5 td's. It has been found at highs and lows. 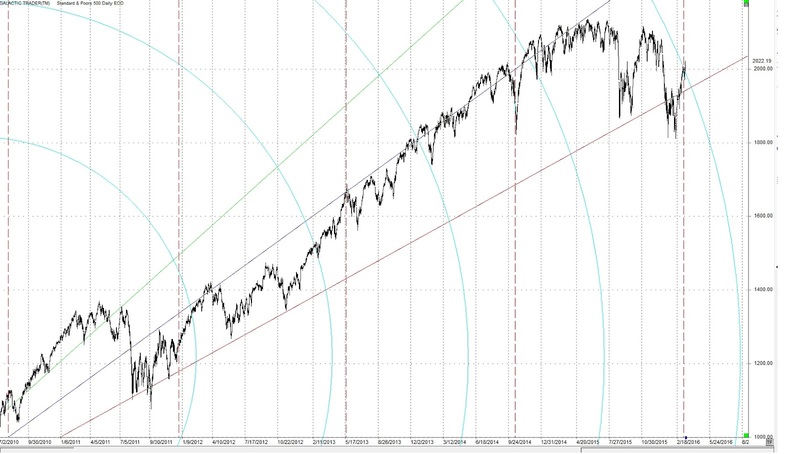 This is shaping up to be a high for the current nominal 6 week cycle .I've added Fibonacci arcs (light blue). 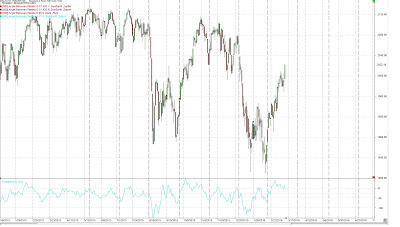 The following daily chart of the SP500 shows the 45 cd (calendar day) cycle. The next hit is March 30. This puts us entering the 15th week of the Primary cycle and entering the 9th week of the 2nd nominal 6 week cycle during this coming week. 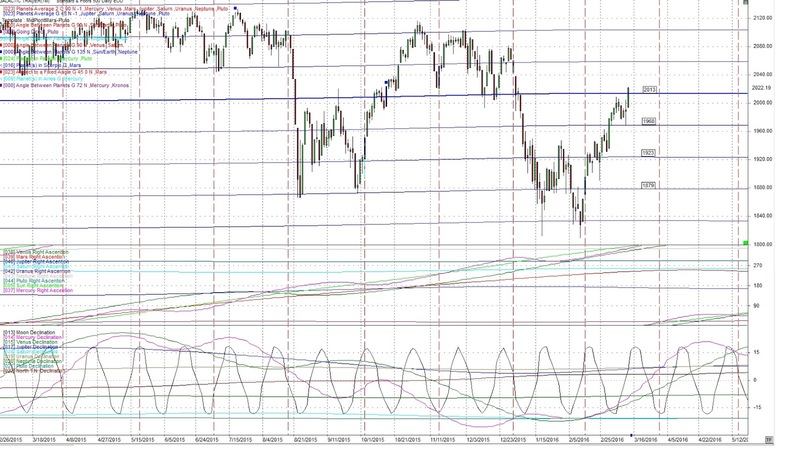 The nominal 6 week cycle has a range of 5 to 7 weeks so this appears stretched. 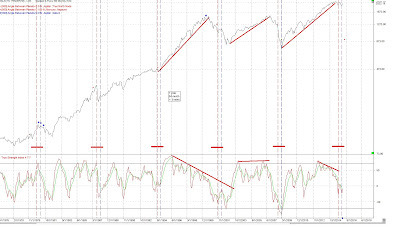 We may be seeing the formation of a 1/2 Primary cycle. As we've mentioned before Mars in Scorpio often results in big moves in Gold both up and down. Mars entered Scorpio on Jan 3, 2016 and will leave Scorpio for Sagittarius on March 5, 2016. Due to retrograde motion Mars will be back in Scorpio later in the year, May 27th in fact, 1 day after a Jupiter / Saturn square. This should be an important period for Gold. 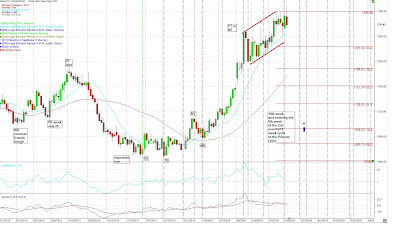 Following is a daily chart for Gold. The blue x's show Mars in Scorpio. Heliocentric Mercury in Sagittarius has passed. I've been trying to figure what has caused the strength in this move. Yes, we had Mars in Scorpio and Gold often rises when this occurs. 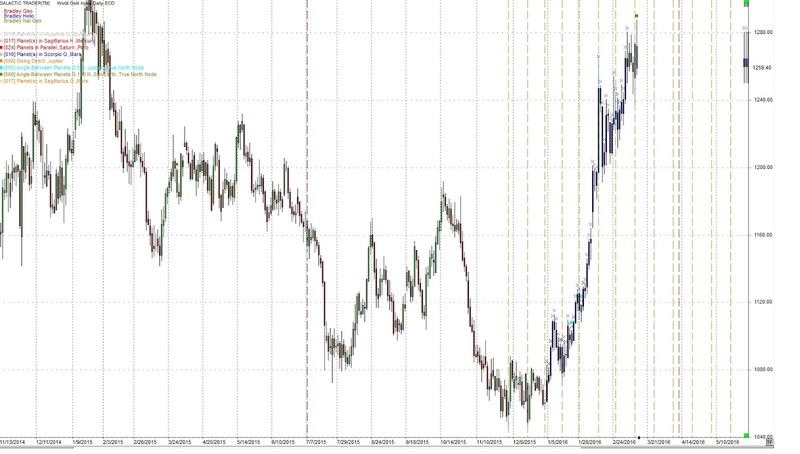 It may just be the fact Gold prices were held down so long they exploded up. Another possibility is Jupiter has been conjunct the North node for most of this period. It has been a rare event that may help explain the powerful move. Perhaps investors are getting somewhat nervous with fiat currencies. "The emperor has no clothes". Negative interest rates certainly helps. With Mars leaving Scorpio I have a small short. We finally saw a down day on Friday. The Sun was opposing the North Node that day. In addition the following is a daily Gold chart showing price is above the 15 day sma. Note the two indicators, Momentum is rolling over and MACD is flat and could rollover as well. 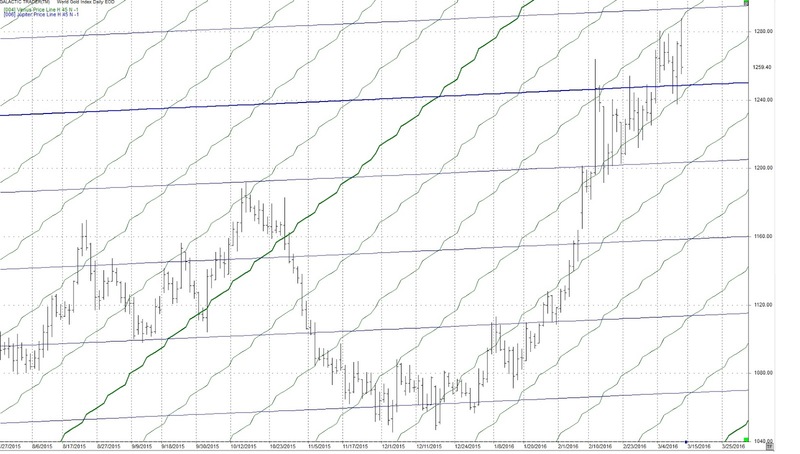 Notice on March 11 Gold moved up and touched the Venus price line (green) and then fell back sharply. Watch this closely next week. My small short got a little bigger. Feb 11 had another lower low and is now marked a Primary cycle trough which has us starting the 5th week of a new nominal 18 week cycle. 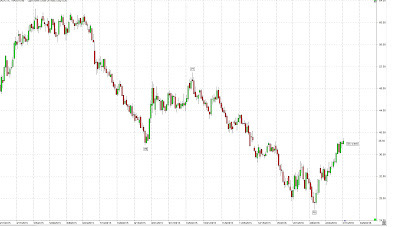 Bear in mind there are geopolitical issues affecting crude which can effect the price quickly and directly. For crude, nothing has changed with the demand, supply situation or the over flowing storage capacity or the flotilla of ships carrying crude with no place to unload. There has been no agreement to limit production quotas. What we do have is many banks around the world holding a great deal of debt for energy companies. I think I'll just watch for awhile. With the comments above under the SP500 Mars will be entering Sagittarius and joining Saturn there on March 5th. This is a war like configuration and being Sagittarius it would not be surprising if religion was involved. This could also be pointing to a terrorist event. I've been looking for Astrological aspects that hit Jupiter or Neptune. Both are co-rulers of crude. There are a few on March 8th when the Sun opposes Jupiter, March 16th when Jupiter trines Pluto and March 23 when Jupiter squares Saturn. 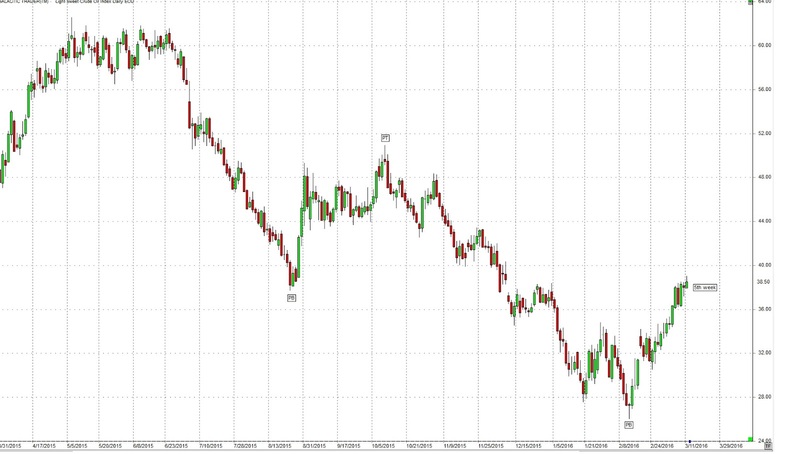 Watch these dates for moves in crude,. It appears we are entering the 5th week of a new nominal 18 week cycle. I've mentioned before when a Primary cycle trough is formed it is usually bullish and we typically get a short dip cycle 2 - 3 weeks after the 18 week cycle trough. 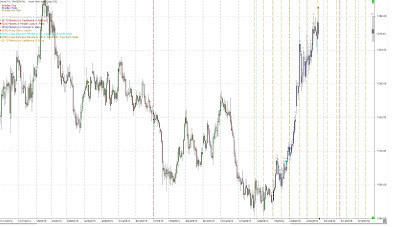 This gives traders the opportunity to get in if they missed the original trough. Feb 24th may have been that dip. We should now be looking for the crest of the first nominal 6 week cycle in the new 18 week cycle. Thank you so much for the time you put into the Blog. I am so keen on reading each week's edition, I get up in the early hours of the morning local time here to read it as soon as you upload it. I know there are quite a few people who are waiting for each blog. I've been trying to get them out Saturday mornings EST. Thanks again. 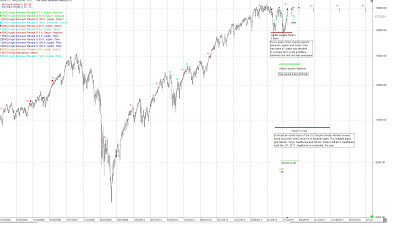 Hi, what are your downside targets for the SPX this week? 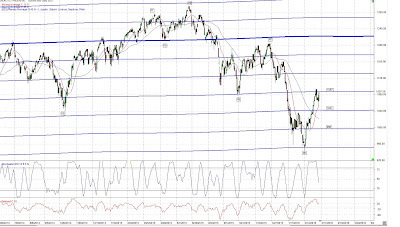 Longer term do you expect SPX to get to the 1600 level before bouncing? Thanks in advance. Hi Gord, what do you think are the chances of the Fed raising rates this week? The economic data release so far supports it. For me its a coin toss, but a rate rise could be a catalyst for the primary cycle low in Gold to occur and the bearish spring stock market you mentioned. Not sure on the FED rate rise. My negative view into the spring is based on the two long term transits mentioned in the blog and report. Jupiter square Saturn and Saturn square Neptune. April has war like aspects. Hi Gord, do you see SPX turning down before April or will it happen later? It continues to grind higher, do you see possibility of new high > 2134 (last May's high)? I want to see the weekly close to be lower than last weeks close. Hi Gord, do you envision more down movement in gold? Thanks! Yes I was looking for Gold to move lower this week. Yes I do the forecast dates 6 months at a time. Currently the forecast dates are Jan - June 2016. July - Dec 2016 will be available late June. Gord,are you expecting any significant move in silver,either up or down, short term? Looking for a low in the next couple of weeks. A low means, lower than it is now. 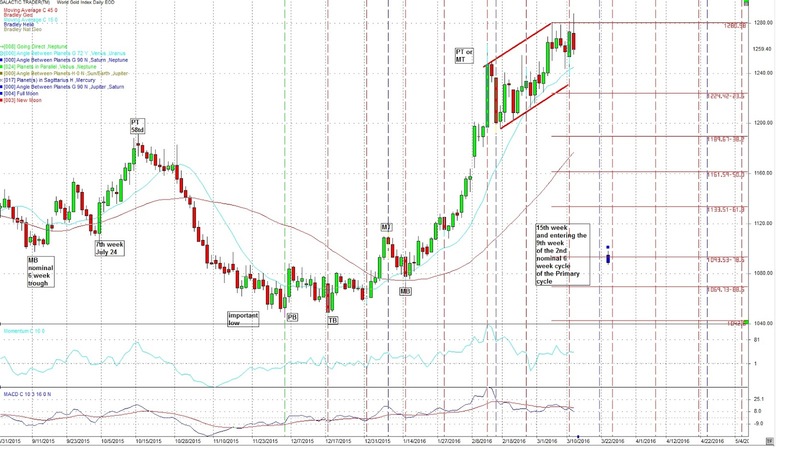 Do you still expect gold to move higher later this year? You would get 6 months from the day you sign up. Anything past June , you would receive in mid to late June. It's $99 for 6 months. The economy is to weak to raise rates, yet the market indices rise. A suspicious rise !